After the collapse of the Soviet Union, Islam in Russia split into two hostile camps. 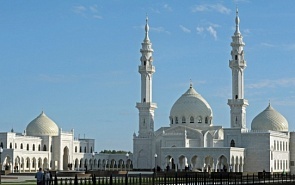 On one side, traditional Islam in Russia represents specific regional forms of Sufism, so-called “popular” Islam, which is in opposition to “pure” Islam, or Islamic fundamentalism. Political Islam, or Islamism, appears when local traditional Islam, being very archaic, cannot meet the growing needs of the community. In today’s Russia, political Islam is represented mostly by the Salafis, but Sufi Islam can also be subject to politics, especially when it is involved in the conflict. For example, during the recent conflict in Chechnya some Sufi Shaykhs invoked their followers to Jihad against the “infidels”. Thus, we can see that Islam is directly linked to the political demands and expectations of the social strata in Muslim regions. The Islamic tradition in Russia emerged in the middle of the 7th century, when the Arabs came to Darband, an ancient city on the Caspian Sea, known in Muslim historiography as Bab al-Abwab. Medieval Arab historian at-Tabari mentioned among those first Muslims some of the Prophet’s companions ( al-askhab ), such as al-‘Alqama and others. But we believe the turning point in the history of Islam in the Caucasus was the middle of the 8th century, when famous Arab commander Maslama built the first Grand Mosque and many local ( mahalla ) mosques in the heart of Darband. He also brought to the region and settled there thousands of Muslim families from different regions of the Caliphate – from Syria, Palestine, al-Jaza’ir, etc. Nowadays traditional Islam in Russia represents those historically shaped Muslim communities: the Shafi‘is in the North Caucasus, the Hanafis in the Volga-Urals Region, divided by many brotherhoods ( Tariqas ), their branches ( al-Awrad ) and spiritual leaders ( Shaykhs ). Officially they are organized on territorial principles into Regional Boards of Muslims ( Muftiats ). But there are some specific features even within these areas: religious life in Dagestan is completely different from that in Chechnya or Cirkassia, or that in Tatarstan from that in Bashkortostan. Political Islam emerged in modern Russia from the first waves of religious revival, when the level of Islamic awareness was still very low. Over the past two decades hundreds of foreign imams and missionaries preached in Muslim regions, challenging the local Islamic traditions. Tens of thousands of Russian Muslims have received Islamic education in the Middle East, mostly in Egypt, Saudi Arabia, Syria and Tunisia. About 9,000 received Islamic education abroad in 2007, and about 4,000 in 2011, most of them simply attending secondary schools. Certainly not all of them became radicals. But they have made great contributions to religious life, as well as to the debates on the nature of “true” Islam. Old-fashioned, self-educated spiritual leaders of traditional Islam were not ready for such discussions compared to the young and dynamic neophytes of political Islam. Adherents to political Islam in Russia view the chain of the Arab revolutions as a natural and long-awaited “Islamic awakening.” The main battleground is the Internet: nowadays the Russian segment of the Internet is awash with sites, forums and debates on the subject. All extremist acts committed “in the name of Allah” in Russia are broadcast on the websites of international Jihadist networks. Hope for social change goes together with the hope of salvation and the possibility of escaping from the problems of real life. According to Islamic radicals, the only way to solve all problems is to return to religion in its only “true” form, with its easily understandable creed. We have to bear in mind that any religious awakening is always deeply personal, and traditional Islam as a formal social institution cannot respond to all new challenges. In the North Caucasus republics radicalism is on the increase as a result of many economic and social processes dealing with transformation. In the Volga-Urals Region the situation is slightly different, but the nature of the destructive processes is the same: the opposition of “true” Islam to the entire non-Islamic world, social protests and cultural alienation. Being a minority in their societies, the Salafis are much more active and mobile in sociopolitical life. Young people are dominant among their supporters, but many of them try to separate the religious outlook of Salafism from its political platform. The negative aspects of Salafi ideology lead to legal, personal, psychological and even philosophical conflicts caused by the dual or even plural identities of Russian Muslims – ethnic, Islamic and Russian. Young Muslim protesters living in a predominantly Muslim environment are a breeding ground for radical Islam. Ideologically, Salafism in Russia is strongly consolidated. Its followers have a common distant enemy – the West, especially the United States and Israel, Westernization and globalization; they called it al-makduniya (“McDonaldization”). Their common close enemies are: traditional Russian Islam, Sufi Tariqas, in particular secular lifestyles, and the political system of Russia in general. When it unites with ethnic separatism and religious extremism, political Islam takes on an anti-Russian political orientation. Otherwise it is trying to become a part of civil society. One of the most effective tools for polemical aggression in Salafism is the practice of takfir – wholesale accusation of unbelief ( al-kufr ). Anyone can be declared a non-believer if they do not share the Salafi concepts, even if they observe all the Islamic laws and traditions. Diversity of Islamic thought, as well as countless spiritual centers and authorities claiming the right to issue fatwas, can produce a host of counterarguments. In this sense, Arab counterarguments against Salafi ideology are not always suitable for Russia, but in some respects they could be useful. The terrorist activities of Islamic radicals have now moved from Chechnya to Dagestan, which is divided into several districts. It is headed by amirs , who lead Jihad on this territory, and organize and coordinate all terrorist acts on the Path of God ( sabil Allah ). The victims of this war are prominent scholars of traditional Islam, muftis and imams. The most influential North Caucasus Sufi shaykh Sa‘id-afandi al-Chirkavi, who was killed in 2012, used to say that "we have our own Islamic tradition, which is very old. We always followed this tradition carefully, even in Soviet times. So we don’t need to correct our ‘Aqida (“our creed”) because of some foreigners, it was handed down to us from our ancestors. " Illegal Islamic radicals create a climate of intolerance and fear. Trying to gain financial independence, illegal Salafi groups have forced the collection of defined voluntary-involuntary tributes from local businesses for “the purposes of Jihad”. Businesses and investments are leaving Muslim areas, as are well-educated professionals, who are not as a rule very religious. The Supreme Mufti of Russia Shaykh al-Islam Talgat Tajuddin said recently that the separation of state and religion does not mean the separation of religion and society. Traditional Islam needs to be reformed and upgraded. Its intellectual level should be significantly increased to protect the humanist potential of Islam from blind medieval proselytism. As regards political Islam, it is not only going to be a part of civil society, but it already is involved in social life, for example, in the reconciliation process in Dagestan, through the practice of al-masla‘a . As a result, collaboration with the state divided the Salafi movement, and it is a completely new trend in political Islam. Islamic protest is partly returning to the legal law space, but partly remains on the margins. It is worth noting that the number of radical Salafis is clearly less than 0.2%, even in the North Caucasus.